Check out our questions and answers below relating to our psoriasis units. Used in Hospitals world wide for treatment of psoriasis, vitiligo & eczema. Psoriasis is a skin condition that results in patches of skin with silvery scales, and red and flaky areas that can be itchy, sore, or sometimes painful. The most common areas affected are the scalp, elbows, knees, and lower back, although any skin surface may be involved. It can also occur in the nails and body folds. Psoriasis is not contagious and cannot be passed from person to person, but it can occur in members of the same family. Psoriasis is not contagious. It is not something you can “catch” or that others can catch from you. Psoriasis lesions are not infectious. It is relatively common affecting around 2% of people in the UK. Men and women are equally likely to develop psoriasis – but it is more common under 35. Different types of psoriasis cause different symptoms. The most common type, plaque psoriasis, causes thick red plaques covered with silvery scales. I have a rash how do I know if it is Psoriasis? If you have a rash that is not healing, seek medical advice for evaluation of the rash to determine if it is psoriasis. A doctor or specialist dermatologist will diagnose psoriasis based on how it looks. They may also arrange for a skin sample – called a biopsy – to be taken and sent for laboratory testing. This should help determine the type of psoriasis so that appropriate treatment can be given. While the exact causes of psoriasis have yet to be discovered, we know that the immune system and genetics play major roles in its development. Most researchers agree that the immune system is somehow mistakenly triggered, which speeds up the growth cycle of skin cells among other immune reactions. Erythrodermic [eh-REETH-ro-der-mik], characterized by intense shedding and redness of the skin. Psoriasis can range from mild to moderate to very severe. There is no cure, but many different treatments, both topical (on the skin) and systemic (throughout the body), can clear psoriasis for periods of time. People often need to try out different treatments before they find one that works for them. Will our units clear up your Psoriasis? No single psoriasis treatment works for everyone, but something will work for most people. Our Psoriasis units offer similar treatment to that provided in hospitals. *(BMJ Medical report – Home therapy v hospital treatment). Is UVB light a proven treatment? More than 400 independent clinical studies around the world have shown that Philips UVB Narrowband (TL/01) Phototherapy lamps are the most effective lamps currently available for the treatment of Psoriasis and Vitiligo, as well as other less common skin diseases. What tubes are in our units? All our units are fitted with Philips uvb narrowband lamps as used in Hospitals worldwide. Philips uvb narrowband lamps for Psoriasis light treatment is now considered by scientists as the way forward. 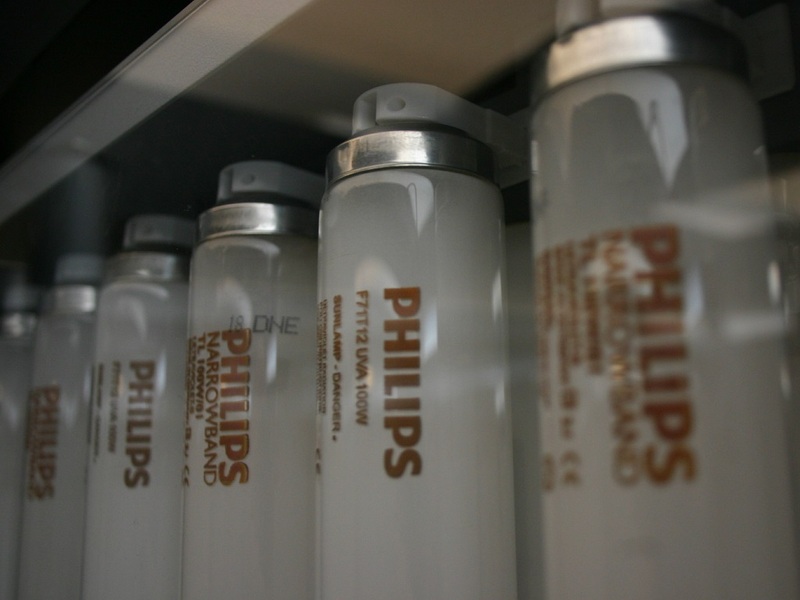 Our phototherapy units provide a UVB Narrowband containing light treatment lamps that are Manufactured by Philips. All our units are manufactured in England and are fitted with genuine Philips brand Narrowband lamps. More than 400 independent clinical studies around the world have shown that Philips UVB Narrowband (TL/01) Phototherapy lamps are the most effective lamps currently available for the treatment of Psoriasis, Vitiligo, vitamin D deficiency, eczema, acne and scleroderma. How long should I hire a Psoriasis Unit for? Most patients with psoriasis need about 15-30 treatments to clear over a period of approx 6-8 weeks depending on the severity of the condition. Patches of psoriasis generally start to become thinner after five to ten treatments. Patients who experience a reoccurrence within a short time after healing may use maintenance programs of treatment, once or twice per week. Narrow-band UVB can result in burning, just like sunlight and broadband UVB. Frequent emollients should be applied to burned skin, and if recommended by the therapist, topical steroids. It sometimes provokes polymorphous light eruption. Long term exposure to ultraviolet radiation ultimately causes skin ageing and skin cancers. If used sensibly Narrowband is certainly less risky than Broadband treament because most of the UVB is within the theraputic wavelength of 311nm, Broadband light is over a much wider wavelength – less UVB in total (and much less within the theraputic wavelength) and a greater percentage of UVA. Care should be taken with the number of treatments over one year and indeed over a lifetime. This will vary from person to person depending on skin type and total dose administered. Will a Psoriasis Unit burn me? Every person has a different skin type and some burning may be experienced if session times are slightly too long for a particular skin type (particularly fair skin), this can be completely avoided by being sensible and reducing session times. Short-term side effects can be totally avoided by following the instructions with care. These are blistering with redness (erythema), which is uncomfortable but absolutely not dangerous. What if I fall asleep while using the unit? All Psoriasis units are fitted with dual safety timers and can only be set for small periods of time. Can I hire a unit without seeking medical advice? Any person wanting to hire a PsoriasisI Unit should seek medical advice. Customers will be asked to sign a disclaimer on delivery of the unit stating that doctors advice has been taken. It is also advised that anyone undertaking UVB Therapy visits a dermatologist once or twice a year for a regular check up. Do I need to book in advance to secure a unit for a particular date? Our Psoriasis canopies are very expensive equipment and we only have a limited number of units for hire. If you require a unit for a particular date or month we strongly advise you book well in advance. If all units are on hire we operate a waiting list and you will be telephoned when one is available.